ASV VT70 for sale in Athens, AL. Haney Equipment Company Inc.
Vertical Lift Loader Linkage. 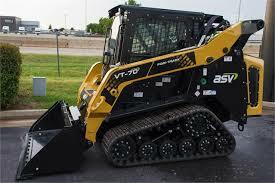 The VT-70 is ASV’s Compact Track Loader with special vertical lift loader linkage that make it your best option for any application where you need to keep the load level or need extended lift or reach, compared to a radial lift loader. Pump capacity: Low - variable from 0-23 gpm / 87.1 lpm. ; High - 28.4 gpm / 107.5 lpm. Controls: variable flow via joystick rocker switch or continuous via console switch. Couplers: Push-to-connect quick couplers mounted on loader arms. Pressure relief valve mounted to coupler block. Hydraulic cooling system: High-efficiency side-by-side radiator and oil cooler. Cooling fan is hydraulically-driven. Drive system: Two hydraulic direct drive sprockets controlled by a single joystick. Track drive sprocket: Elevated with low-friction and replaceable sprocket rollers. Undercarriage suspension: Two independent torsion axles suspend each track frame. Roller wheels: 24 high-density polyurethane and rubber wheels per track. Wheel bearings protected by metal-faced seals. Seat: Adjustable contour vinyl with built-in operator presence switch, lap bar and 2 in. / 51 mm wide seat belt. 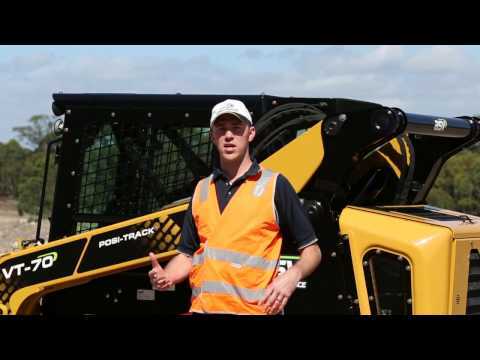 Loader control: Right-hand electronic joystick controls loader lift/lower, tilt, plus intermittent control of aux.hydraulic. Drive control: Left-hand electronic joystick controls machine speed and direction. Engine speed control: Hand-operated throttle. Indicators/gauges: Engine RPM, fuel level, coolant temperature, engine oil pressure, voltage, hydraulic oil temperature, engine hour meter. ROPS: Meets SAE J1040 MAY94; ISO 3471. FOPS: Meets SAE J1043 SEPT87, ISO 3449. Illumination: Two adjustable forward-facing halogen lights; Two adjustable rear-facing halogen lights; and one interior light. Convenience: One 12-VDC power port located inside operator station.